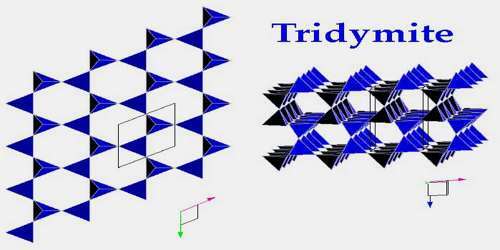 Tridymite is a mineral SiO2 that is silica, differs from quartz in its usually minute thin tabular orthorhombic forms of crystallization, and is found in cavities in trachyte and similar rocks. 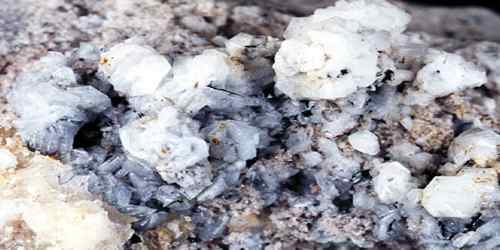 Its its crystals are very distinct and form very different habits from Quartz. Many Tridymite specimens are in fact pseudomorphs of Quartz after Tridymite, as the Tridymite often alters to the more common Quartz in many environments. It was first described in 1868 and the type location is in Hidalgo, Mexico. The name is from the Greek tridymos for triplet as tridymite commonly occurs as twinned crystal Trillings. After Quartz replaces the Tridymite, it still retains the original, distinct crystal form of Tridymite. True Tridymite and Quartz pseuomorphs are virtually indistinguishable without locality knowledge or x-ray analysis. Tridymite commonly occurs in igneous rocks, more abundantly than cristobalite, as in the trachytes of Rhineland-Palatinate, Germany; northern Italy; and in the Massif Central, France. Tridymite, also found in meteorites, has the same chemical composition as coesite, cristobalite, stishovite, lechatelierite, and quartz but has a different crystal structure. It can occur in seven crystalline forms. Two of the most common at standard pressure are known as α and β. The α-tridymite phase is favored at elevated temperatures (>870 °C) and it converts to β-cristobalite at 1470 °C. In the U.S., Tridymite occurs in the Thomas Range, Juab Co., Utah; Beidel Creek, in the San Juan Mountains in Colorado; Obsidian Cliff in Yellowstone National Park, Wyoming; Highway 78 roadcut, Big Lue Mountains, Greenlee Co., Arizona; and Mt. Lassen in Lassen Volcanic National Park, California. In December 2015, the team behind NASA’s Mars Science Laboratory announced the discovery of large amounts of tridymite in Marias pass on the slope of Aeolis Mons, popularly known as Mount Sharp, on the planet Mars. Although Tridymite crystallizes in the triclinic system, it is always a pseudomorph. It will either be a pseudomorph after Beta Tridymite, which crystallizes in the hexagonal system, or a pseudomorph of Quartz, which also crystallizes in the hexagonal system. Thus Tridymite occurs in hexagonally shaped crystals. Its crystals are usually small, and appear as thin tabular plates. They commonly form intergrowths of two or three thin individuals, forming unusual and distinctive twins or Trillings. Tridymite also occurs as small grains and as complex icicle-like formations. Tridymite, silica mineral, the stable form of silica (silicon dioxide, SiO2) at temperatures between 870° and 1,470° C (1,598° and 2,678° F); at lower temperatures it transforms to high-quartz, at higher to cristobalite. It has three modifications: high-tridymite, middle-tridymite, and low-tridymite. Tridymite forms thin hexagonal plates that are generally twinned, often in groups of three; its name alludes to this habit. 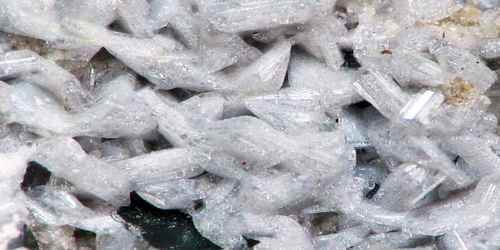 Tridymite is a valuable mineral to collectors. Specimens of this rare and distinctive mineral provide interest to hobbyists. Tridymite is also used in scientific study. Its crystals provide key information to how crystals form, and how they change over in different environments. 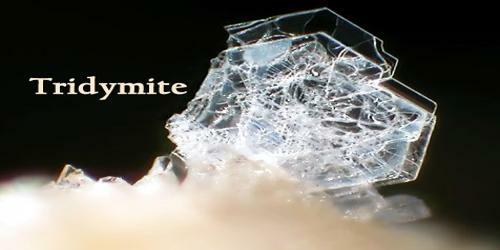 Tridymite is also synthetically produced for the production of refractory ceramics.